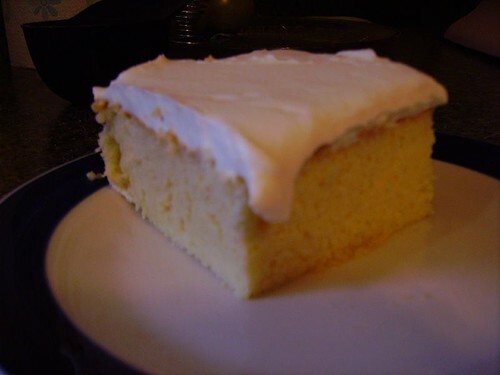 Tres leches is popular throughout Latin America. 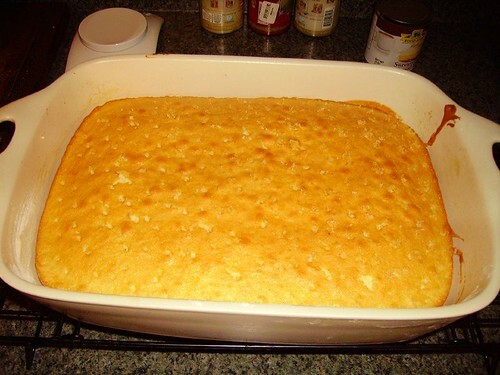 No one’s really sure of where the original recipe came from–some think it might have been one of those recipes that circulated on the back of a can of condensed milk (probably in the early 20th century). This would make sense given the degree of love that Latinos shower on condensed and evaporated milk–even I, in the minimally-expressed Puerto Rican ethnic environment of my youth, remember that my mother always had cans of condensed milk in the house (though I never remember them actually being used for anything). I wouldn’t dare to hypothesize on whether it was the popularity of canned milk products in Latin America that led to the popularity of tres leches or vice versa–it’s probably one of those mutual symbiosis jobbies. This recipe happens in three phases: the cake, the glaze, and the whipped cream, which acts as frosting. Since it takes a while for the glaze to work its way into the cake, I prepared everything but the whipped cream the day before. 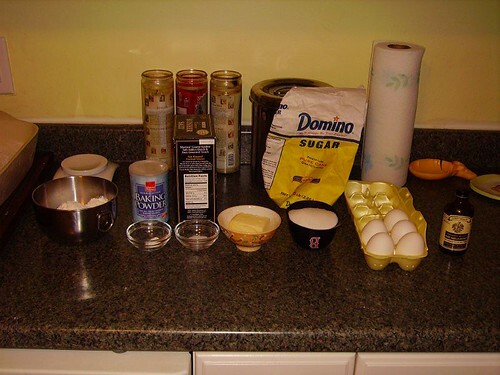 I assembled the ingredients: cake flour (6 3/4 oz. by weight), baking powder (1 tsp), kosher salt (1/2 tsp–if using table salt cut this in half), butter (4 oz or one stick, at room temperature), sugar (8 oz b y weight), 5 eggs, and vanilla extract (1 1/2 tsp). A few notes on ingredients: yes, cake flour is very important, as is the weight measurement. Cake flour is far lower in protein than other types of flours. This means less gluten development during mixing, which leads to a more tender cake. 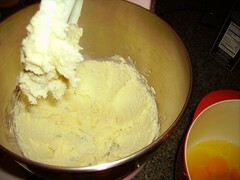 In addition, the cake flour is milled much more finely than other flours, which also contributes to the tender texture. Because of this, it’s much more desirable to measure cake flour by weight than by volume–the fine grind of the flour means it’s extremely compressible, and your volume measurement is probably going to be off. As for the butter, room temperature is important–this is what will ensure that the creaming step does its thing properly. If you have chilled or frozen butter, microwaving it EXTREMELY SLOWLY is acceptable. Go ten seconds at a time until you can just leave a little crater in the butter when you poke it with your finger. The zeroth step in the recipe was to preheat the oven to 325 degrees. 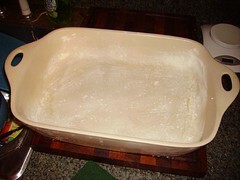 The first step involving actually preparing food was to oil a 13×9 inch pan and dust it with flour. Oiling the pan helps to stop the cake from sticking to the pan, and the flour ensures a cleaner release from the pan than the oil alone. Next, I combined and whisked together the flour, baking powder, and salt in a bowl. In the work bowl of the trusty stand mixer, I used the paddle attachment to beat the butter at medium speed until it got light and fluffy and increased in volume a little. This is the first step in creaming. The next step is to drizzle in the sugar very slowly while the mixer is running at low speed. This allows the fat in the butter to enrobe each granule of sugar, which helps give the cake good lift and texture. While I was doing this I made sure to scrape down the bowl occasionally to make sure everything was properly integrated. 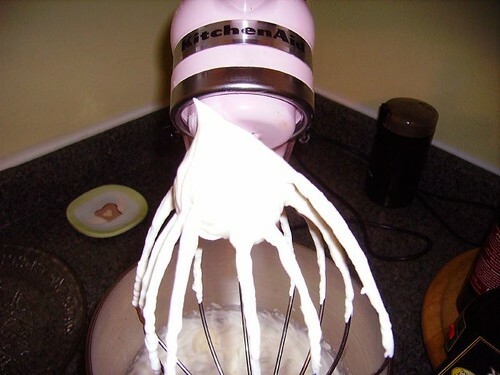 The last step in creaming is to add the eggs–one at a time–while the mixer is still running at low speed. 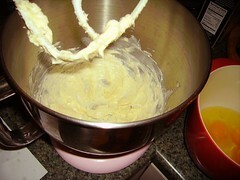 Only add the next egg after the previous one is thoroughly mixed into the batter. Finally, I mixed in the vanilla extract. Now that the wet ingredients are taken care of, I added the flour mixture, a little at a time, with the mixer at lowish speed, until everything was integrated. Scraping down the bowl was important here too. When I was finished, I had a very yellow, rather wet batter. When playing along at home, try not to over-mix it–stop your mixer as soon as your last bit of flour has mixed thoroughly into the batter. Before it was time for glazing, the cake had to cool for half an hour. As it was cooling, I combined one (12 oz) can of evaporated milk, one (14 oz) can of sweetened condensed milk, and one cup of half-and half (the eponymous three milks) in a bowl, and mixed them thoroughly. Once the cake was cooled, I poked it all over with a bamboo skewer. The top shredded a little in this process, but since the whole thing would eventually be covered in whipped cream, I wasn’t too worried. 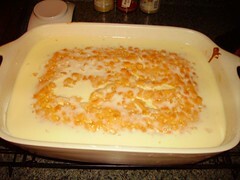 Once the cake was cooled, I poured the milk mixture over the cake. At first, the mixture pooled on top of the cake, in a manner that would most certainly not make for an appetizing final product. 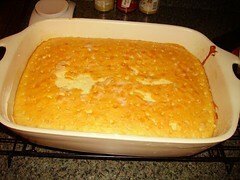 In just a couple of minutes, however, the glaze soaked into the cake and there was pretty much not trace of the liquid. Even though the glaze had sunk into the cake, it wasn’t really absorbed into the structure of it yet. 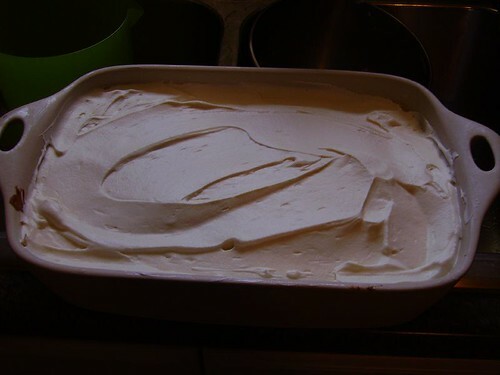 It would take a few hours for the glaze to really make its way into the cake’s structure, so it was time to pop the cake into the fridge to let time work its magic. One sometimes sees maraschino cherries adorning the whipped cream layer, which would be a nice touch, but which would go perhaps a step too far towards reinforcing the already sugary-sweet character of the cake. I think a better garnish would be some sliced strawberries, perhaps arranged in little florets across the top of the cake. The tartness of the strawberries would do good in cutting the sweetness of the recipe, as well as adding some brightness. And boy was this recipe sweet! 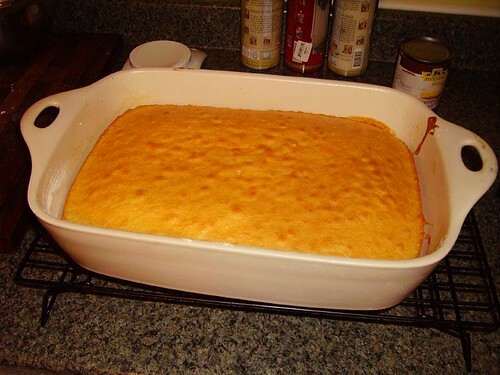 The rich cake, sweetened condensed milk flavors in the glaze, and astonishingly sweet whipped cream combined to create a saccharine treat that was delectable despite its insulin-coma-inducing sweetness. Yes, I ended up having three pieces despite–or perhaps because of–this insane sugary goodness. Somehow the combined forces of sweet come together to form something more sublime than the constituent parts. That being said, even though the Hispanic cultures are known for their sweet desserts (flan, fried ice cream, that bright orange Jarritos-flavored bundt cake that we found at Food Lion that one time), I will probably cut back on the sugar content significantly the next time I make this. I will probably try to reduce the cake to 6 oz. of sugar and scale the whipped cream back as far as 4 oz. Any more than that and the cake would probably lose its characteristic ability to induce fits of hyperactivity. Said hyperactivity certainly contributed to our enjoyment of the wonderfully terrible Jesus Christ: Vampire Hunter. I encourage you to watch this film, with or without a sweet dessert. It’s Canadian!